"Some Comments on Constructivism "
It may look obvious but it can be easily overlooked that constructivism is a theory of learning and not a theory of teaching. Discovery is a process a learner goes through, and through this engagement, a learner acquires knowledge and a better understanding of oneself and one's world. It does sound attractive for it describes learning that goes beyond a simple acquisition of knowledge to knowing itself. It is with an emphasis on the pupil that one sees the relevance of one's background, as learning is viewed as building on one's experience. The perspective and the distinction between learning and teaching is important. Failure to appreciate the difference will result into failure in education. 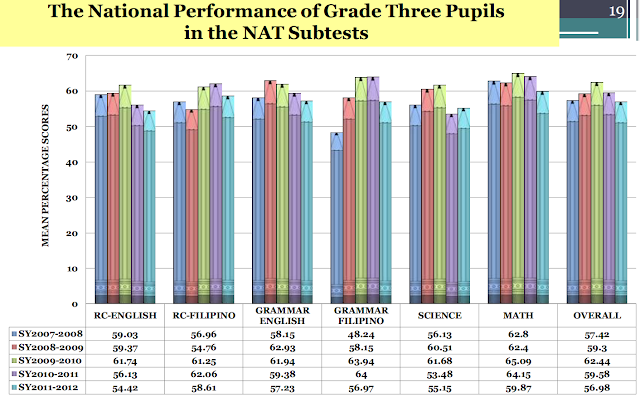 And unfortunately, it is not clear, in my opinion, how much DepEd appreciates this difference. Applying constructivism into teaching involves the following. 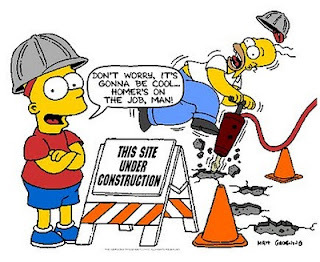 First, the classroom needs to be designed around the learner. It requires individualized attention so that each pupil's background, preconceived notions, previous experiences, and current skills are carefully considered. Second, frequent conversations between the teacher and the students, and among the students themselves are required in order to have a dialogue that will lead to a new and shared understanding. Third, the actual input of new knowledge is provided either by a formal lecture or an exploration (experiment). Fourth, both teacher and pupils need to become aware of their own understanding and learning processes. Research active professors in universities should see that the above characteristics are very similar to how a research group operates. Although research projects are designed to solve specific problems, how research is done on a day-to-day basis relies very much on each student's characteristics. Research groups need to hold group meetings where results are presented, discussed and debated. And, of course, novel experiments are performed and a careful thorough review of literature on the research topic is a must. Lastly, in each and every step, a conscious effort is made to understand how and why each step is taken. Research activity is indeed a striking resemblance of discovery-based learning but this should not be surprising since research is discovery. This resemblance is quite useful in extracting the elements necessary for a successful constructivist teaching practice. Transferring constructivism as a theory of learning to a theory of teaching requires careful consideration of all the elements outlined above. And at the center of this exercise, quite ironically, a focus on what is required from the teacher is necessary. The professor in a research group is both a facilitator and director. Teachers cannot serve as facilitators if they themselves refuse to learn new things. And direction cannot be achieved if teachers lack mastery of the skills and concepts that need to be learned. There is no doubt that a teacher in a discovery-based learning classroom needs not only to be a master of the content of the subject to be taught, but also cognizant of the inner and deeper workings of the discipline to which the subject matter belongs. On the issue of how teachers should be prepared for discovery-based learning, it should be noted that professors in research universities attain their academic positions by going through the same discovery-learning process as graduate students and postdoctoral researchers. 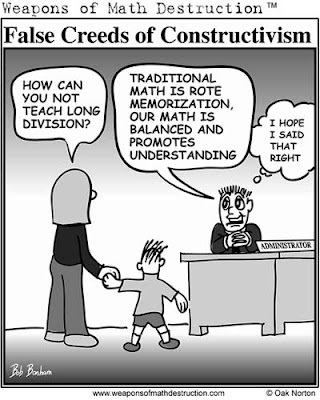 Thus, it is clear that constructivism as a teaching practice can only be learned by teachers through constructivism. Teacher training on discovery-based learning cannot be achieved by mere instruction. Research professors do not learn research from lectures, but by doing research as students. Based on the current status of higher education in the Philippines as outlined in "Role of Higher Education", it should be crystal clear that the Philippines has a long way to go to support discovery-based learning. The mindset is not there. The discipline is not there. The recognition of what discovery really entails is completely absent. 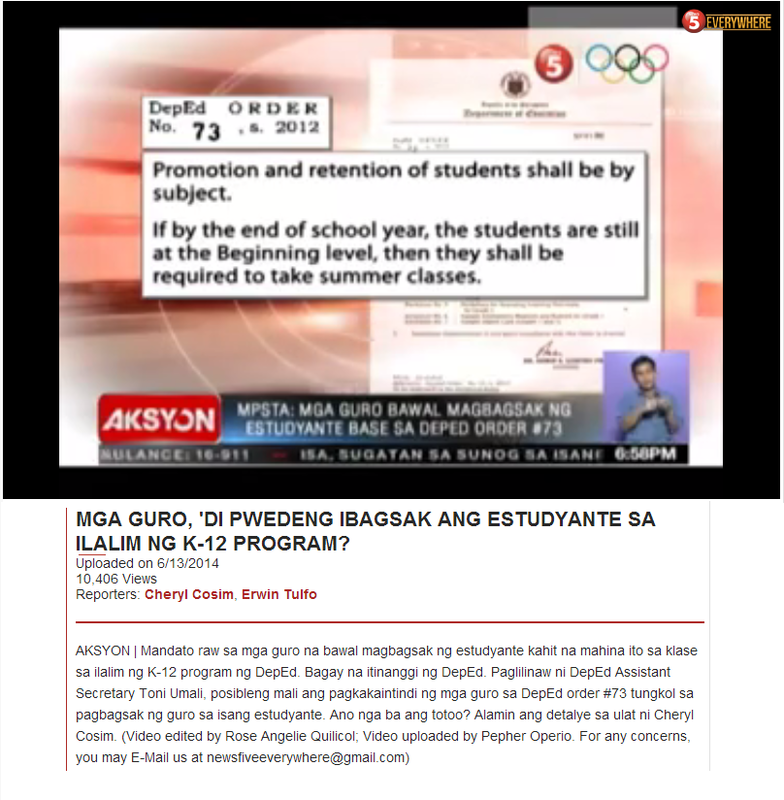 As long as society does not place importance on research, as long as society does not embrace the standards that rule research, as long as society keeps its positions of high influence on education and research on the shoulders of individuals who lack a record of research and scholarship, the Philippines will be so ill-equipped to implement constructivism in its classrooms. Assessment of outcomes in a discovery-based learning environment also requires different tools and criteria. Written exams usually test only mastery of content. Discovery-based learning needs to be evaluated on the basis of how well students are able to process and integrate new information. Research activities are reported in articles that describe the work that has been done, which begins with an introduction outlining background information as well as a placement of the work in a broader context, and ends with an analysis and discussion of the results obtained. These articles are then subjected to expert peer review where these could be challenged, corrected, accepted or rejected. Discovery-based learning must be accompanied by a comparable assessment method. DepEd embraces discovery-based learning with the notion that this forms part of the solution to the current woes of Philippines basic education. 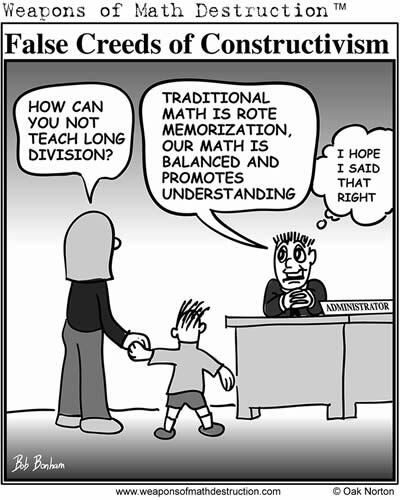 Constructivism in teaching is not the best practice for everyone and is not the best for every purpose of education. The elements of discovery-based learning are clearly outside the resources DepEd could possibly provide. Short school hours, large pupil to teacher ratios, and lack of mastery of subjects on the part of the teachers will work strongly against discovery-based learning. Such combination will only fail. "Unfortunately, the progressive/constructivist approach is markedly inferior to traditional, 'teacher-centered' pedagogy, particularly when it comes to teaching students important skills like reading and math. Most students do better if they are taught with traditional methods, such as 'direct instruction." Education Schools: Helping or Hindering Potential Teachers?